In addition to traditional kitchen and bathroom cabinetry, we can also install cabinets in your Lakeland, FL garage, utility room, craft room, or any other area! There are many places in your home that new cabinetry can enhance. Think beyond the typical kitchen cabinetry and bathroom cabinetry. You already know that cabinetry in these areas provides storage and organization, so it makes sense to take that same advantage to your garage, utility room, craft room or elsewhere. 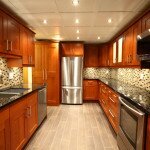 Garage Cabinetry – There are two ways to add cabinetry to your garage. One is to purchase it specifically for the garage. There is cabinetry that is especially designed for this purpose. The other route you can go is to do a kitchen renovation to modernize your kitchen and then use the existing cabinetry in your garage. Utility Room – Cabinetry in your utility room can make those laundry tasks so much easier. You will have a great place to store laundry soap, dryer sheets, bleach and other chemicals that will stay out of sight, yet within easy reach. You can also store other items, such as extra towels, rags and other household cleaners. And by having a countertop on your lower cabinetry, you now have a great place to fold laundry. Craft Room – If you have a craft room or some other special-purpose room, adding cabinetry can make it more organized and useful. You can put all those materials and equipment behind closed doors, so you may even find you can get more than one use from that extra bedroom. You could add a pantry, for example, so you can take advantage of those great sales at the store and stock up on things you use often. At Jim’s Floor Depot in Lakeland, FL, we are experienced with using cabinetry in ways you might not have thought about before. Of course, we can also take care of new cabinetry in your kitchen or bathrooms, as well. Give us a call for a free in-home measuring and estimate.